More and more employers are encouraging their staff members to volunteer together. Giving back can be a wonderful opportunity for team building, and it can be an engaging, fun, meaningful way to spend a weekend or a workday. But company-sponsored community service events aren’t just good for your employees; they’re good for your business, too. Here are six reasons why you should be engaging your team with opportunities to volunteer, and some advice on how to get started. Volunteering lets you reaffirm your company’s values and beliefs. Practice what you preach. While you can’t expect to choose an organization that means the most to every single employee at your company, you can use volunteering as an opportunity to back up your company’s overall values. If housing is important to your company, volunteer with Habitat for Humanity. If you’re passionate about empowering women in the workplace, try Dress for Success. If you work with a bunch of animal lovers, arrange for teams to volunteer together at local shelters. 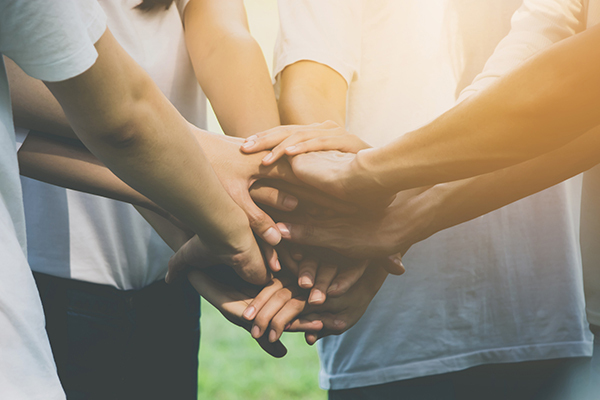 You can, of course, work with multiple organizations, but you should choose to donate your time to groups that excite your employees and connect to your company’s mission, if possible. It encourages your employees to use skills and creativity they don’t often get to use in the workplace. Volunteering allows people to come out of their everyday roles and get creative, says Rhonda Meadows, Senior HR Business Partner at Xenium HR and founder of nonprofit organizations Project Lemonade and Bridge Meadows. It allows your team to express the gifts they have beyond number-crunching, gifts that often go unnoticed in corporate settings. While preparing for volunteer events, Meadows says employees regularly offer skills she’d never have expected, like singing lessons and woodworking. Employees often welcome the chance to show different sides of themselves, as being recognized for their unique skills helps them feel like they matter to the company. This also allows employees to get to know each other better. It’s a huge marketing opportunity. Don’t feel guilty for showing off how you give back. According to a 2013 report from Cone Communications and Echo Research, 82 percent of consumers consider corporate social responsibility when they’re deciding what to buy and where to shop. If you are giving back to your community, you should be celebrating that publicly. People are more likely to feel an affinity for a brand or company that’s connected to their community. It instills loyalty in your company from your staff, too. When you consider what is important to your employees, and listen to the purposes they want to serve, they’re more likely to stick with you. Giving back instills loyalty in your team because it shows them the company isn’t only concerned about the bottom line. Your employees are more likely to support you vocally if they feel like they’re working for a company that cares. It can have an enormous impact on nonprofit organizations, and that makes volunteers feel good. It improves morale and productivity. So many people want to start volunteering but don’t know where to look, she adds. Providing the opportunity as a company helps narrow down the sea of choices and gives your employees a broader sense of purpose. Then, Meadows suggests opening a dialogue with your employees and asking how they want to help the community. To be truly meaningful, and to get higher attendance at these events, volunteer efforts must grow from company-wide support.